Are you glazed or cake? I am a one plain cake and one strawberry glazed kinda gal. I savor them with a paper carton of milk, and then get woozy from sugar overload and remind myself that to try and visit and eat at every recommended donut shop in America may be a bit ambitious... even for me. It’s hard to remember the exact moment when my love for donuts started us on a quest across America to find the perfect one. Whatever it may have been, that memory is clouded in a haze of sugar, sugar glaze and pink sugary frosting. We were on a road trip along the Jersey Shore in the summer of 2006 and one afternoon we made up a pitcher of Margaritas to drink over the next few days, but in fact, we drank them all that day! The next morning, a trip to the Dunkin’ Donuts in Asbury Park to test the medicinal properties of donuts saved our lives and allowed us to carry on. Perhaps, it was the summer of 2007. On a stifling hot day I was shopping at Pearl Paint down on Canal Street in New York City. I needed strength to carry on. Again, it was into the local Dunkin’ for ice coffee and a pink (theoretically strawberry) frosted donut. Once again, the copious amounts of sugar revived me and I was able to not only carry on purchasing my art supplies, but to also pick up a faux Kate Spade mini-bag. Probably the real clincher that led to the quest was the green and white New York Jets Donut I picked up Near Frida’s eye doctor in New York State. A raised, sugar glazed number frosted with green and white frosting and topped with sprinkles. What’s not to love? Life Beyond Dunkin: The best come in three categories: Glazed, Cake and Loaded. So without further ado here are some of our favorite places to eat donuts in the United States. The very best glazed donuts we ate anyplace were the ones we ate at Fox’s Donut Den in Nashville, Tennessee. It was more than just the charm and generosity of the owner and his family, the airy little devils they make melted in our mouthes... no way could they been calorie laden. Owner, biology professor at Lipscomb University and chief cook, Professor Norman Fox has been serving them warm, light and gently glazed with a slightly crisp outside since 1973. We were definitely not trying to hustle them, but somehow we walked out of Fox’s Donut Den with a gift of about two dozen donuts and a few blueberry holes. We polished off all warm glazed we were given before we left the parking lot. It did, however, take us two days to eat the rest, and we ate them all, with only a little help from Sully. Even two days later they were still good... especially the Apple Fritters. Fox’s uses an old recipe from Oliver Harlow, who used to own a chain of donut shops, Harlow’s Honey Fluff, that stretched from Memphis, Tennessee through Mississippi and Illinois. Professor Fox has been eating donuts around the United States for 39 years and has never tasted one better than his own. If he did, he would somehow get the recipe. His are the best. There is a funky little blue donut place in Natchez, Mississippi that helped get us started on our quest to eat the best donuts in the United States. We have noshed our way through a lot of deep-fat fried cake donuts since that chilly, rainy, January day in 2008 when we visited the Blue Donut Shop in the early morning and then returned for more that same morning after visiting Longwood Plantation. The second round was as good as the first. At the time, we did not realize that donuts would join NFL Tailgating, outsider art, birds and other themes that we pursue as we wander about the country. They were that good! The Fry Cakes at McPherson’s Orchards near Rochester, New York are wonderful cake donuts by another name. The third category: Loaded consists of donuts that I am not ashamed to admit I ate. Every so often we end up in a donut establishment that only sells “gourmet donuts.” Often they are not even “real” Donuts, but if it has a hole, we will let it slide, make the sacrifice and eat it. Some are so elaborate or large that one can barely lift them, much less dip them in coffee. At the top of the Loaded list is the ever elusive GOURDOUGH’S BIG. FAT. DONUTS in Austin, TX. Elusive because it is operated out of one of Austin’s famous mobile food trailers. These cars, trucks, wagons, Airstreams and carts are located all over the city and, possessing wheels, they move around. With help from the locals, and after walking almost four miles, we finally located Gourdough’s... and not only was it worth every step, but we were thankful for the long walk home after eating just one apiece. Each fancy donut, fried and dressed after you order it, is about the size of Sully’s head. I had the Funky Monkey, a huge fresh fried donut with grilled bananas, cream cheese frosting and brown sugar. Bernie humiliated himself by eating an entire Sin-a-Bomb, truly a caloric, fried delight with cinnamon, sugar, raisins, butter, pecans - and more butter and sugar. At least I gave Sully a few tiny bites of mine, although he seemed pretty happy licking the ground around the trailer’s pick up window. And of course don’t overlook Sublime Donuts in Atlanta, Georgia and their never to be forgotten Red Velvet Donut. Enjoy this short slideshow of our donut excesses without fear of sugar overload. fascination with them, but it's a sweet(!?) subject. The very best donut ever made was at Carlson's Bakery on West St. in Annapolis. It was like no other. It was not a cake donut but very soft and light, somewhere between the cake and a popover. It was very soft like a tempura effect. The bad news is that Carlson's was sold and the new owners have not gotten the recipe correct. They are selling something called the "potato donut" but it isn't the original Potato Glazed Donut. Donuts ..... a great way to start the morning! I would like to add a donut stop for your next trip down I-55 through Southeast Missouri. Hoeckle's Bakery in Perryville, Missouri, is a family-owned bakery that's been in business for more than 50 years. The bakery started out in a small building on the court square until about 3 years ago when they built a new bakery and added sandwiches to the menu. I recommend the donut holes (I can pop a dozen with my coffee and not even notice!) and the club sandwich wrap (the spinach wrap is wonderful!) Enjoy! And thanks for sharing your adventures! Love to read all your crazy stories. Sounds like you have been having a great time around the country. Are you planning to head back to the Outer banks any time soon? Hope all is well. Take care and continue to enjoy all those donuts....did you try Duck Donuts/ they are melt in your mouth too. Do you know what a bore it is to be regularly reminded of people seemingly doing nothing but having a good time? If not, read the regular reports from a wastrel duo who seem to have nothing to do but enjoy the life most of us find a pain in normally unmentionable body parts. 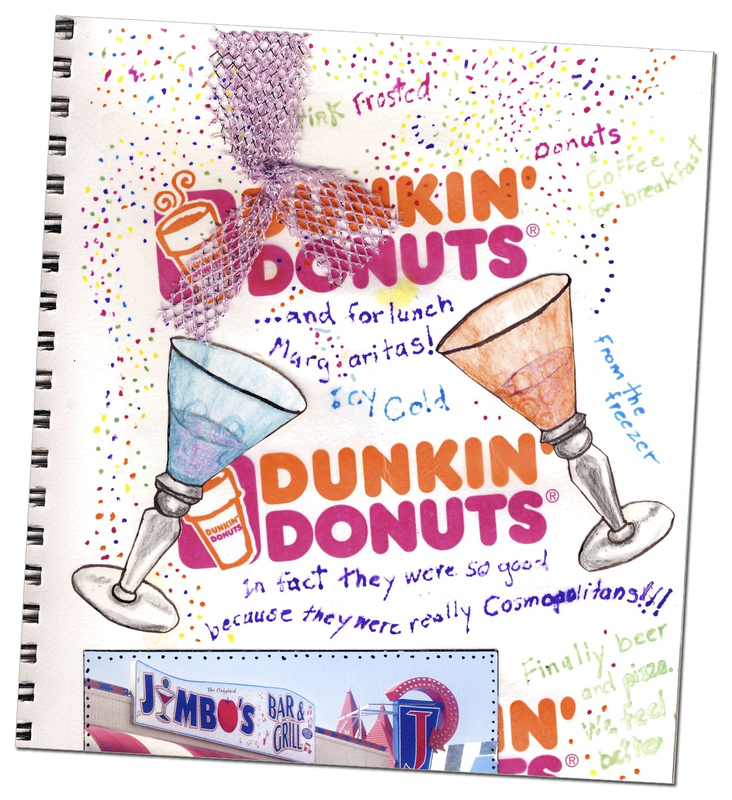 Deliciously fun to read of your donut adventures! Am off to town to get one as that's all I can think about now. Hmmmm, which one(s) to get? Marny, fire up your donut machine and I'll fly up for at least a dozen of your Fry Cakes.